Per capita driving has peaked in America, and with that new normal comes the question of whether or not we should be spending limited transportation funding on building new roads. If nothing else the driving trends support the wisdom of a “fix-it-first” policy that focuses on highway maintenance over expansion. The New York Times has a personal piece on the cost of cars on out health. Its nothing new but explores how our lives have been hijacked by cars. I know thay my time im Taipei has shown that a life in motion feels healthier. It resonates with me. How about you? 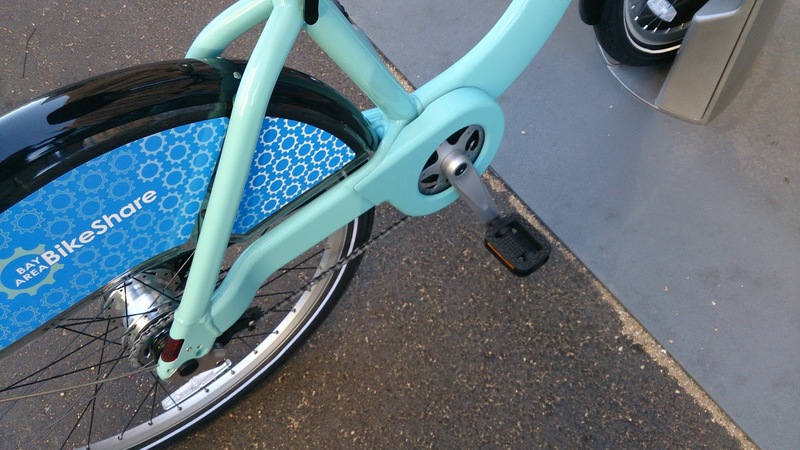 The New York Times reports on a cool innovation that will make bicycling more accessible within cities. This wheel makes a standard bicycle a battery assisted the story is in share graph below. Apologize for the wonky post but Android is being funky again. I have to admit the internal hubs of citibike and Bay Area Bike Share are working great too. Just found out the SFPD has created a Twitter account for bike thefts. https://twitter.com/sfpdbiketheft Follow for news and to report. your PSA for the day! Well it has been a month and I am looking forward to statistics on the success of Bay Area Bike Share and it looks like they are working the kinks out. Bikes are being relocated regularly so in most cases it is possible to get and return a bike in most cases. Oddly it seems more challenging to find a slot to return a bike than get a bike with the Fourth and King station being particularly problematic. This illustrates the demand for mass transit interchange options. For me coming in from the South Bay I have to figure out how to get to 9th and Market. Thankfully I have a few options. 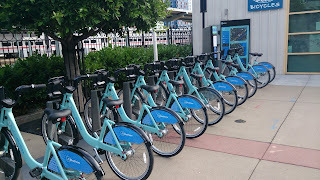 A private building run shuttle, the 83x and now bike share. This combination solves a key problem which is availability. Given Caltrain's current erratic performance (which to be fair is not always their fault, the sad state where people are unable to get help is an issue we all have culpability on), it is not always clear that I will have a ride where the wait time can be upwards of 30 minutes. 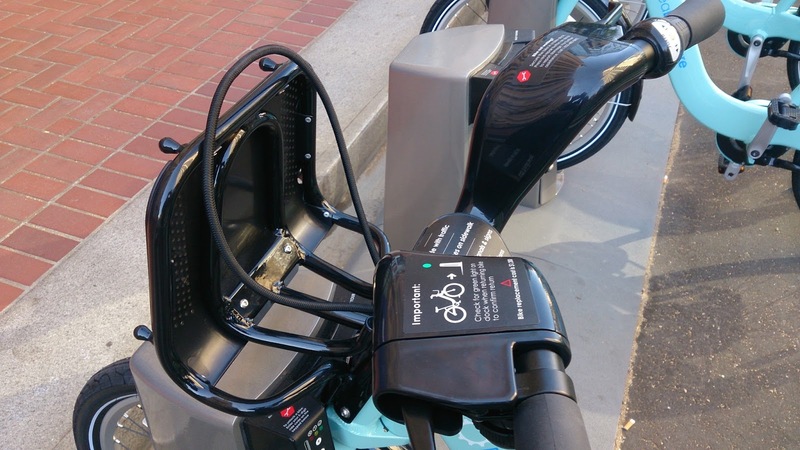 Bike share brings the advantages of taxis in that a ride is immediately available. The mixed modes of transportation options suggests that Bike Share would benefit from joining the clipper system to enable more riders a quick way of getting on their ride. But the option of immediate transport I think has driven the success. Mass transit could fill the gap but they cannot provide the options of random destination. Anyone from a Car2go city care to share their experience? Dynamic routing off of arterial pathways works for bikes can it work for cars. Zipcar is great for your home but its not how people live. It's no secret that I am a member of the Bay Area Bike Share and I even have the t-shirt to prove it. I was out of town during the opening but after Labor Day I have had quite a few opportunities to give it a try and so far the verdict is hopeful. There are a lot of kinks to work out and San Francisco does not have a leader of the stature of JSK to s Whay ape the landscape to make the city more bike friendly. So despite its similarities it doesn't match up to CitiBike but let's focus on the bike share program we have not the one we wish we had. 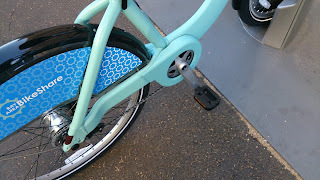 First off, the bikes are fantastic and easy to use. Their clunkiness is almost a point of pride in the hipsteris locked inaticism of San Francisco. They arEncnot quite as iconic as CitiBike. But the Bianchi like green and the distinct frame make them stand up. I like the strapped rack in front and the enclosed chain guard means any one can hop on without fear for their pant legs. The practicality of the design is solid. While the routes I have been taking have been mostly flat (Caltrain to various parts of Market St and back) the shifting has been responsive and easy to use. we'll see how the shifters last a year from now. If CitiBike can survive I am sure BABS will too. I am not sure if the gearing will be sufficient for some of the hills here. That combined with the weight will be a natural corral for most riders. Less gratifying for the bikes has been the quick release seat posts. A lot of people aren't familiar with the lever mechanism of a quick release and occasionally the mechanisms are too loose. A ratchet system may be more robust. I had a few times where the seat started to slip. Riding the BABS bikes is very reminiscent of riding a bike in Amsterdam or Beijing, freeing and casual. I haven't ridden Bicci in Barcelona or Toronto but my sense is that these bikes are more robust. A rear rack might give more freedom and utility for errand takers. This is probably the most confusing part of the experience. When I started I had a lot of confusion about how to activate and get my bike. I inserted my key and nothing happened. So I would put it into another bike rack and nothing happened. Then I thought I had to activate with the kiosk. And then it would work. That actually was just a coincidence. What the key system is slow in comparison to our modern age. You learn the cryptic yellow light to green light dance that means you can grab your bike. It still seems a little iffy on any rack that you will be able to pick up your bike and go. The return is just as dicey. At $1200 a pop you want to make sure the bad boy is locked back in. It too has a weird "Close Encounters of the Third Kind" kind of light dance. It is just missing the soundtrack. Once you figure it out its not top hard but befuddling at the beginning. The website is overly genericor the page map just bites. The racks serve their function but pay attention in the return. The videos of. Bikes not "returned" on YouTube are not for the faint of wallet. If you are in San Francisco and downtown I am going to declare BABS a qualified success. 90% of the time I am able to find a bike or be able to return a bike. Note that there needs to be bikes and free racks to the end to end nature to work. Commuting endpoints like 4th and King have brought disappointment at tines but I think this will get better as they figure out the load and flow of riders. It is a backup to muni or vice versa. The cost of the system works out if you are already a mass transit rider. At $88/year if you substitute 4 muni rides you are net even, any rides beyond that is gravy and for short rides you are faster than Muni in many cases with the trade off a little literal sweat. This will be the big challenge of Bay Area Bike Share is that San Francisco is a notoriously difficult city for commuters, but it's terrifying for novices. San Francisco is a cacophony of different transport methods and they seem to mix in their own random ways. There are not clear rights of ways and we are a city lost in our own distractions. Most of the accidents have been distraction related to our little masters the mobile phone. There are some protected arteries such as Market, but even then they share the road with cars and buses in unpredictable ways. It will take a lot more cyclists to establish a normal experience on the roads for people to co-exist. I am really excited by how well BABS has been working out, it's done a good job with some tough constraints. With more bikes and more stations, I think BABS can be a great complement to Muni. I wonder for some of the hillier places if bike style ski lifts could be a solution to help novices and less fit people power these up the hills. One can always dream. But if you are a regular Muni or Bart rider, the $88 breaks even after 5 rides per month.